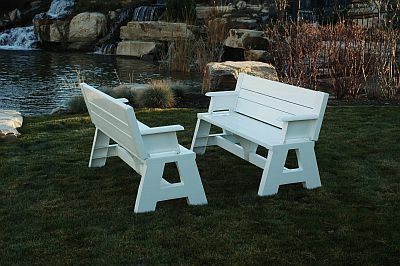 The Convert-A-Bench is perfect for the patio, porch, balcony, or by the pool. They are even great for indoors. Two benches convert to a picnic table, making this a truly versatile piece of furniture. If you have guests over for a cookout, you can use the benches for seating and once the food is off of the grill, flip the backs of the benches over to make a table with seating. The convert-a-bench is made of durable resin and vinyl for years of use. The 5 foot wide benches easily seat 6 adults. 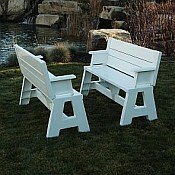 These light weight benches are easy to carry and are perfect for RV's or camping. If you are looking for a functional piece of patio furniture, the Convert-a-Bench is it. Made in the U.S.A. Note: Two benches must be purchased for them to convert to table.